(Hong Kong, 17 October 2017) Vitargent (International) Biotechnology Limited (“Vitargent”) is known for the earlier published safety examination of cooking oil, BB cream, instant coffee, sun cream and ice-cream on Test-itTM platform (www.fishqc.com), and Vitargent is now extending the investigation to lip alm products with the world-exclusive “transgenic medaka” and “zebrafish” embryo toxicity testing technology that was developed by Hong Kong scientists. Test result of 31 popular lip balm product samples have been published, and the safety test rated 16 samples as Green Fish (excellent), 4 samples as Yellow Fish (basic), and 11 samples as Red Fish (sub-optimal). Among the 8 sunscreen lip balm samples, 7 of them failed to comply with the Medaka embryo testing for chronic toxicants (xenoestrogens), and the level of estrogenic endocrine disruptors (EEDs) in lip balms of several international brands has severely exceeded Vitargent’s standard by 11 times. In Zebrafish embryo testing for acute toxicants, some samples have exceeded the safety standard by 24 times, and the poison effect is suspected to be the consequence of ingredients such as Retinyl Palmitate, Benzophenone-3, Butylated Hydroxytoluene (BHT) etc., exhibited biological toxicity alone or in the form of mixture. Consumers are recommended to pay special attention on choosing lip balms, and should consider products with less extra ingredients and functions. Autumn is around the corner and it’s time to protect lips from drying out with lip balm. However, some packaging of lip balms claims extra functions such as pharmaceutical sunscreen, water resistant, rectifying lip wrinkles and dull colors, recovering pressured skin cells and more. Consumers might overlook that the extra functions come with chemical substances which potentially raises health risk under excessive intake. 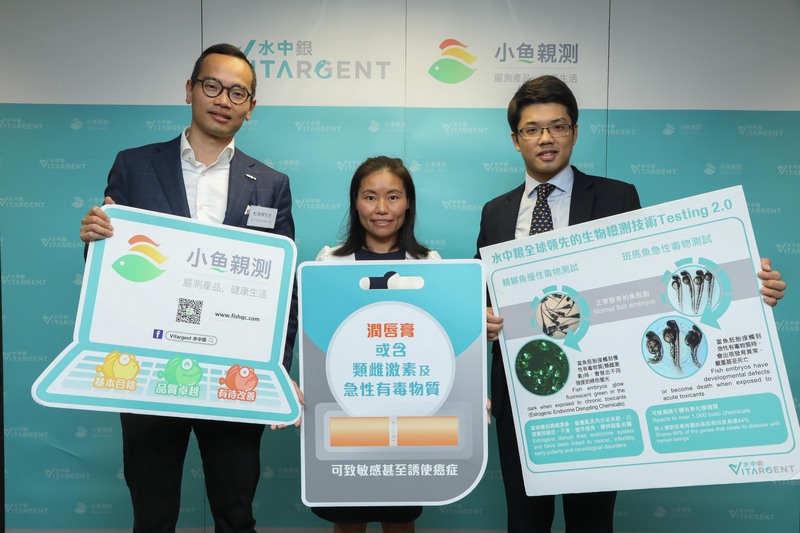 With that in mind, Vitargent has collected 31 lip balm samples during April and May among 30 brands from beauty halls, Watson’s and online shopping platforms such as Kaola.com, Jingdong and Tmall and put them to the fish embryo toxicity test. Its samples came from world famous brands like NIVEA, Innisfree, CUREL, KIEHL’s, MAYBELLINE, Mentholatum and more. Among the 31 lip balm samples, Test-itTM rated 16 samples as Green Fish (excellent), 4 samples as Yellow fish (basic) and 11 samples as Red Fish (sub-optimal). In terms of price, among the 31 samples collected, the average price is 15.3HKD/gram. The cheapest one costs 2.2HKD/gram, which is around 26 times cheaper than the most expensive one which costs 56.9HKD/gram. Among the 10 samples that cost lower than 7.5HKD/gram, 6 samples were rated Green Fish (60%), 2 were rated Yellow Fish (20%), and 2 were rated Red Fish (20%). Among the 11 samples that cost between 7.5HKD/gram and 15HKD/gram, 5 samples were rated Green Fish (45.5%), 1 was rated Yellow Fish (9%), and 5 were rated as Red Fish (45.5%). Among the 10 samples that cost more than 15HKD/gram, 5 were rated Green Fish (50%), 1 was rated Yellow Fish (10%), and 4 were rated Red Fish (40%). All in all, lower priced lip balms are safer than mid, higher priced lip balms, with 60% of them passing the safety test and rated as Green Fish; whereas a 40% Red Fish rating is observed among mid, higher priced lip balms, consumers are recommended to purchase with extra caution. In terms of brand origins, Vitargent selected products from Asia, Europe, America and Oceania region. Among the 6 samples of Asia brand (Mainland China, Japan, Korea), 4 samples were rated Green Fish (66.7%), 1 was rated Yellow Fish (16.7%), and 1 was rated Red Fish (16.7%). Among the 7 samples of Europe brand (France, Germany), 4 were rated Green Fish (57%), 1 was rated as Yellow Fish (14%), and 2 were rated as Red Fish (29%). Among the 16 samples of America brand (the USA), 7 samples were rated Green Fish (44%), 2 were rated Yellow Fish (12%), and 7 were rated as Red Fish (44%). Among the 2 samples of Oceania brand (New Zealand, Australia), 1 was rated as Green Fish (50%), and 1 was rated as Red Fish (50%). For the place of manufacture, samples selected were manufactured from China, Korea, Japan, France, Germany, the USA and Australia. Among the 31 samples, all 5 samples from Mainland China were rated as Green Fish (100%), 2 samples from Korea were rated as Red Fish (100%). Out of the 2 samples from Japan, 1 was rated as Green Fish (50%), and 1 was rated as Yellow Fish (50%). Out of the 6 samples from France, 3 samples were rated as Green Fish (50%), 1 was rated as Yellow Fish (17%), and 2 were rated as Red Fish (33%). Out of the 2 samples from Germany, 1 was rated as Green Fish (50%), and 1 was rated as Red Fish (50%). Out of the 13 samples from the USA, 6 samples were rated as Green Fish (46%), 2 were rated Yellow Fish (15%), and 5 were rated Red Fish (39%). 1 sample was from Australia and it was rated as Red Fish (100%). To wrap up, in terms of brand origins Asia has the best performance when compared to Europe, America and Oceania region, with more than 60% of the samples rated as Green Fish. Place of manufacture wise results are similar with brand origins comparison with Asia performing better, Mainland China in particular. As for the Zebrafish embryo testing for acute toxicants, there are 8 samples failing the safety test. Among which the sample with the highest acute toxicants is 24 times higher than Vitargent’s safety standard. The team found toxicants such as Benzophenone-3, Retinyl Palmitate, Butylated Hydroxytoluene (BHT), Citral etc., which may exhibit biological toxicity alone or in the form of mixture. In the presence of toxic substances, the embryo development will be affected, and adverse effects such as tumor, heart edema; severe malform, or even death directly. SCCP (Scientific Committee on Consumer Products), Opinion on benzophenone-3, 16 December 2008. Ghazipura et al. Exposure to benzophenone-3 and reproductive toxicity: a systematic review of human and animal studies. Reproductive Toxicology. 73, 175-183. 2017. EFSA Panel on Food Additives and Nutrient Sources added to Food (ANS); Scientific Opinion on the re-evaluation of Butylated hydroxytoluene BHT (E 321) as a food additive. EFSA Journal 2012;10(3):2588. Bauer et al., The lung tumor promoter butylated hydroxytoluene (BHT) causes chronic inflammation in promotion-sensitive BALB/cByJ mice but not in promotionresistant CXB4 mice, Toxicology 169 (2001) 1–15. EFSA Panel on Contaminants in the Food Chain (CONTAM); Scientific Opinion on Mineral Oil Hydrocarbons in Food. EFSA Journal. 2012;10(6):2704.